Soon after the First World War, there emerged a new type of schoolboy story which was very different to the public school sort of which Frank Richards was the most famous, if somewhat subversive, exponent. As noted last week, the values that such books celebrated – in general, if not in the person of Billy Bunter – were those the ruling classes were expected to uphold in the service in particular of the British Empire. Both the Empire and the ruling classes however were less supremely in control after the War, and titles such as ‘Play Up, Royals’ and ‘Our Fellows at St Mark’s’, redolent of exhortations to a collective to live up to common ideals, had to compete with the very different priorities of the emerging middle class. Of course it may be argued that I am reading too much into different tastes amongst different groups at different periods, but to me the title of the first book in a series that was to dominate schoolboy fiction over the half century after the war sums up the very different approach to life that took over Britain during this period. I am referring to ‘Just William’, in which Richmal Crompton brought alive in 1922 the irrepressible highly individualistic scamp who ran riot amongst first and foremost his own family, and then the village at large. This was a life closer in background, if not in its frenetic activity, to that of most schoolboy readers, as opposed to the rarefied context of a public school with chaps who exclaimed ‘My giddy aunt’ and schoolmasters who were more at home in Vergil’s world than the 20th century. The first story in this first William book, ‘William goes to the pictures’, exemplifies the contemporary nature of Crompton’s subject matter. William goes, for the second time in his life, to the pictures, when they were just becoming popular in their earlier silent form, and watches first a tale of ‘desperate crooks who, on coming out of any building, glanced cautiously up and down the street in huddled, crouching attitudes, then crept ostentatiously on their way in a manner guaranteed to attract attention and suspicion’. Then there was a simple country love-story, then a love story ‘of a noble-hearted couple, consumed with mutual passion and kept apart not only by a series of misunderstandings possible only in a picture play, but also by maidenly pride and reserve on the part of the heroine and manly pride and reserve on the part of the hero’. Then there was a comedy in which everyone got covered in paint and fell downstairs, and finally there was a story of a drunkard’s downward path. William naturally took on the more dramatic features of all the interesting roles when he emerged from the cinema hall, most notably the part of the brother who had brought the noble-hearted couple together by ultimately explaining ‘to each the burning passion of the other’. Unfortunately he explains his sister Ethel’s passion to a young man who had just enlisted her aid in proposing to her best friend. The manner in which William draws the man into coming round to seeing his sister in the evening, having given him a crushed rosebud he claims was from her, and the tongue tied conversation that occurs, while both await ‘some explanation of the visit’, typify the absurd consequences of the only slightly off centre reasoning in which Richmal Crompton and William specialized. My own favourite in that book is ‘The Show’, in which William and his gang, the Outlaws, put on an exhibition to earn money, by painting a dog blue and making Ethel’s cat wild and so on. Since all these are soon seen through by their audience, William displays his mother’s aunt as she snores lustily during an afternoon nap. He describes her as a ‘Fat Wild Woman Torkin Natif Langwidge’, and the village children are duly impressed. Not entirely unfortunately, the aunt wakes up while assembled children are goggling at her, and leaves the house in high dudgeon. Mrs Brown wants William scolded, which Mr Brown obligingly does, while slipping William a half crown, delighted at the departure of an unwelcome guest who had shown no signs previously of leaving. Richmal Crompton, who I was astonished to find was a woman, a spinster who evidently thrived on nephews and nieces, had a vivid imagination that kept the books going over several decades. There was a hysterically funny scene when William was thwarted of his ambition to play Hamlet in the class play. Having boasted to the girl next door, the trusting Joan who adores him, that he would be the star, he found it difficult to accept merely the role of a page. Trusting to the boy selected to play Hamlet falling ill, he decides to learn the part, but since this is too difficult, confines himself to the ‘To be or not to be…’ speech, which is obviously what the whole scene is about. The boy does not fall ill but, seeing Joan in the audience on the day of the performance, William decides he has to take over. He advances to centre stage and begins the great speech, not entirely accurately, ignoring all commands to stop. The irate drama teacher finally gets on stage to remove him, whereupon a chase ensures, William all the time declaiming madly. Though he has to face retribution when the curtain finally comes down, on top of the drama teacher, he had seen Joan overwhelmed by laughter, so that it all seemed worthwhile. William of course dominated the series, but there was a splendid supporting cast, including Ethel who is adored by a host of young men, many of whom think wrongly that the way to her heart is through William’s favour and/or stomach. William also has an older brother Robert who adores each and every young lady who comes into the neighbourhood, the more lively of whom find William much more fun. In addition to the other three Outlaws, the lugubrious Henry, the energetic Ginger and the long-suffering Douglas, there is the ghastly rich Hubert Lane, who had a rival gang and relies on cunning which is no match for William’s natural over the top exuberance. And perhaps most memorable of all, there is the spoiled little rich girl of the village, Violet Elizabeth Bott who, if thwarted, would threaten to ‘thcream and thcream and thcream’ till she was sick. In the difficult days of defending Sri Lanka’s human rights record in Geneva, I was delighted to find that Dayan Jayatilleka was also an aficionado of William as well as of Billy Bunter. We whiled away tense or depressing moments by drawing comparisons, picturing anguished cries of ‘Yarooh’ when a Bunter type, such as Nick Thorne the large British Ambassador who had first inspired a motion against Sri Lanka, felt punctured. 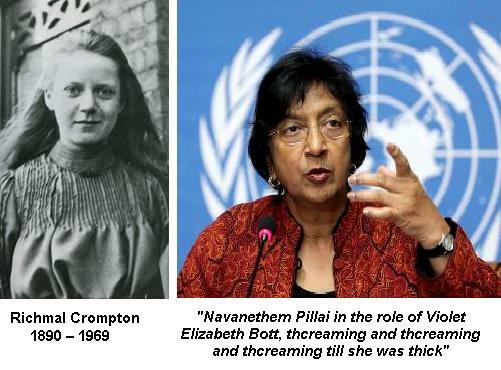 And we were vastly entertained by Navanethem Pillai in the role of Violet Elizabeth Bott, thcreaming and thcreaming and thcreaming till she was thick, when she was thwarted in her efforts to have Sri Lanka censured at a special session of the Human Rights Council. I am not sure that we did not carry the comparison too far, thinking of ourselves as Outlaws whom the Foreign Ministry considered beyond the pale. But we consoled ourselves with the thought that, like the Outlaws, we had won through even when the odds seemed stacked against us. 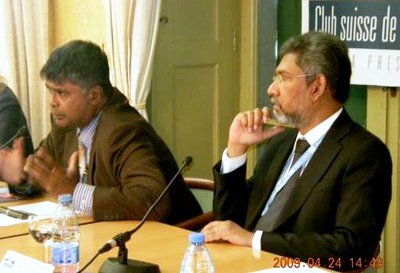 Mangala Samaraweera might have complained later, in declaring that Dayan and I were responsible for much he thought amiss, that senior Foreign Ministry professionals would have done a better job. But it was Richmal Crompton’s achievement that she showed the limitations of the proper old world of the stiff upper lip and helpless quiet submission to the dominant ethos.